This 2017, HMD Global has re-launched the ever lost Nokia brand with a heap of smartphones with a range of low-end to the pricier ones. While the phone called Nokia 8 was a flagship smartphone from Nokia in the year 2017, it has been accepted by Nokia users that the Nokia 8 will be successfully succeeded by the Nokia 9 in 2018. Nokia 8 got too many positive reviews especially for its Quad HD display, classy design language, impressive camera and the delightful Android experience. The upcoming new flagship phone from Nokia, the Nokia 9 will probably have everything that was good and famous in Nokia 8 and will have some added features. Nevertheless, there are too many speculations and rumors regarding the handset and you may read on the concerns of this post to know more on this flagship gadget from Nokia. Anticipated features of Nokia 9 – No, they’re not just rumors! If you check out the gossips and rumors that were doing the rounds last month about Nokia 9, this flagship phone will sport a QHD display of 5.5 inch. It could also have an 18:9 display since both the Nokia 6 and the Nokia 8 were rumoured to arrive with bezels which are slimmer than before. The Nokia 9 will come with 2 variants in storage, 1 with 64GB internal storage and 6GB RAM and the other with 128GB storage and 6GB RAM. As per the images that got leaked, the Nokia 9 would sport a rear panel that’s glossy and it will be either made with metal or glass and the rear camera will have both a vertical dual camera. Another source suggests that the dual camera of Nokia 9 will have a wide angle lens or a secondary telephoto. This kind of speculation came to existence post the release of Android Oreo 8.0 for Nokia 5 when few testers found out that the camera app was redesigned with both wide-angel and telephoto support. If any of these would be added to Nokia 9, it could stand apart from Nokia 8. To take a retrospective glance at Nokia 8, the dual rear camera was good but the second camera had a monochrome lens and it is being said that the Nokia 8 (2018 version) will also don a similar combination. Since Nokia is expected to launch this device during January, the Nokia 9 is anticipated to go with Snapdragon 835 chipset instead of the 845 processor which has been newly announced. The flagship with Nokia 8 (2018) is expected to come with IP6 certification since both the iconic Nokia phones will drop the headphone’s 3.5mm jack. They are both predicted to run on Android Oreo 8.0 which is the latest version. 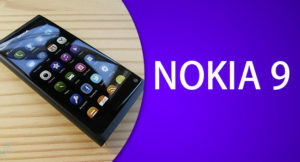 If you’re a gadget freak and a Nokia-lover, you must be waiting for the launch of this flagship phone. However, you have to wait for the phone to be officially unveiled and to know the accurate price. Nevertheless, reports suggest that this phone from Nokia will be price-tagged at CNY 3,699 which amounts to approx. 36,000 INR. However, the 128GB model will come at 40,800 INR. So, now that you have come to know about the best features of the brand new flagship phone from Nokia which is all set to hit the markets in January, 2018, what are you waiting for? Prepare yourself financially so that you can buy it as soon as it arrives in your nearby stores.